A worker labels packages at a FedEx warehouse in Chicago. It's crunch time for getting packages delivered in time for Christmas, and companies like FedEx, UPS, the Postal Service and even Amazon are feeling the stress. Online spending is expected to rise at least 15 percent over last year's record holiday season, according to Adobe Analytics. Long before you click "buy" and type in that shipping address, most e-retailers have already anticipated your order. In some cases, that item you just bought is already sitting in a nearby warehouse or fulfillment center and could be delivered in a couple of hours. But most gifts are coming from a lot farther away, and getting them delivered in time to be under the tree Christmas morning involves a complicated system that's under more pressure than ever this holiday season. Once the order goes through, the item goes by truck and maybe by plane, too, to a shipping hub, like the massive new UPS Super Hub in Atlanta. "We are about the size of 19 football fields, 1.2 million square feet," says UPS spokeswoman Kim Krebs, who adds that it is not just size that makes this hub super. "It's the latest in operations technology, powered by a lot of big data," says Krebs. "We're able to process through here around 100,000 packages an hour, which works out to about 1,700 a minute." Those packages are zipping through the facility over 18 miles of conveyer belts, which are designed to handle all kinds of shapes and sizes. "If you look at how they're coming down and you look at the actual belts themselves, you'll see that there's different textures, different sizes and also different speeds," that eventually move the packages into a single line, Krebs says. Smart labels on the packages are scanned by six-sided scanners, so no matter where on the package the label is placed, it can be read. That information tells the system where each package should be directed, so it can be moved to the right place to be reloaded onto a truck that is headed toward the package's final destination. UPS estimates it will deliver 800 million packages between Thanksgiving and Christmas, up from 762 million packages during the same holiday period last year. And company officials say this new superhub and billions in other facility upgrades and technological improvements should help prevent a repeat of problems UPS had last year, when some 3 million packages a day were delivered late. The explosion in online holiday shopping is not just pressuring UPS but other shippers, too, like never before. Data from Adobe Analytics show online holiday season spending this year already tops $80 billion and may top $125 billion before the season ends. The biggest load will be delivered through the mail, as the U.S. Postal Service will deliver 900 million packages between Thanksgiving and New Year's Day — and that's in addition to 15 billion other pieces of mail. 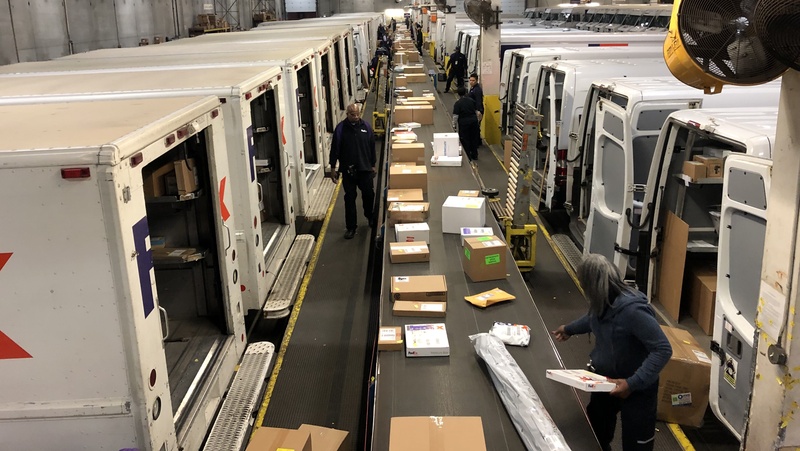 This last week before Christmas is the busiest of all for the post office, as carriers will deliver some 3 billion pieces of mail. So across the industry, shippers and retailers have been investing in their logistics networks, pouring billions into building new warehouse and distribution facilities, delivery vehicles and technological improvements to try to get better at delivering packages in shorter periods of time. But even with increased automation, package delivery is still very labor intensive. UPS hired 100,000 extra workers to handle the holiday crush; Amazon continues to add huge numbers of contract and full- and part-time employees, and FedEx hired 55,000 seasonal workers to deliver about double its usual 14 million packages a day. Trucks line up in unloading bays at the FedEx Express distribution center on Goose Island near downtown Chicago. A few hours before dawn at the FedEx Express distribution center on Goose Island near downtown Chicago, there's a steady stream of semitrucks backing into unloading bays. Each is full of four or five giant metal containers. "We refer to them as cans, actually," says Michael Murphy, senior operations manager for this FedEx facility. He points out that many of the cans have rounded or curved edges on the top of one side. "They're actually shaped to be put into the belly of an aircraft," he says. 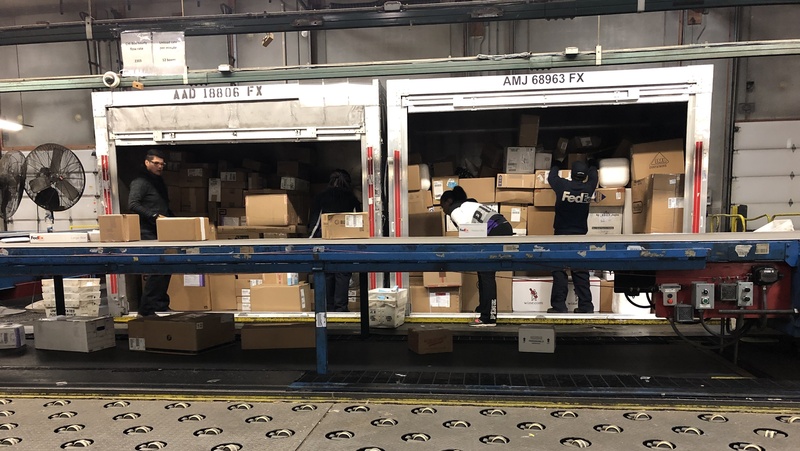 These cans came off FedEx planes at O'Hare airport, and now, workers unload their contents — 300 to 600 packages of various sizes from each can — and place them onto conveyer belts that move them through the facility. Murphy says that along the way, workers scan the packages with handheld scanners. "A lot of the bar codes are encoded with specific information that's gonna help us determine what truck and what route and then what order sequence that they're delivered in," he says. "They're also putting a small label on it that helps our couriers down here that are filling the trucks know which side of the belt that goes on, what numbered truck that goes in, and what position it's loaded to into the truck." The scans also are used to update customers who can track their package all throughout the delivery process. Murphy says the e-commerce boom has completely changed the dynamics of the business over the past 10 years, not only because customers are ordering so much more stuff online but because of the kind of stuff they're having delivered. "It's a rug that you might need for that front room; it's the new 70-inch TV," he says. "I just saw a bed frame go down here a couple of minutes ago, so it's something that we didn't see 10 years ago." The packages move down a final conveyer belt between two rows of boxy delivery vans and trucks that are backed up to the belt. Couriers grab packages labeled for their routes and load them, based on size and destination, to make the most efficient use of truck space and the couriers' time. When the 150 trucks are full, they launch almost all at once, but it's not chaos. It's more like a ballet than roller derby. "It's engineered," Murphy says. "It's not a big circus — it's extremely orchestrated and almost calm, the way they launch." Engineers also design the delivery routes to keep trucks moving. "Having a truck sit in traffic is not very efficient and not good for business," says Murphy. "A huge thing is utilizing technology to get us around traffic [jams], and to move our operations out of peak traffic areas." But there's no denying that all these delivery vans from FedEx, UPS, Amazon and other delivery services are choking traffic themselves and straining roadway infrastructure not really designed for this magnitude of commerce. The supply chain itself is not without kinks, as many packages still get lost, arrive late or are left at the wrong address. And, increasingly, theft is a problem. It's estimated that millions of packages are stolen off doorsteps and front porches. Loading trucks at the FedEx Express distribution center on Goose Island. But experts say e-commerce delivery systems work pretty well, especially considering how many packages are delivered at this time of the year and how sharply it has increased over the past decade. "One of the things that still does surprise me is the accuracy and the speed and the quality control that has been developed and is present in this delivery system," says Anne Goodchild, founding director of the Supply Chain Transportation and Logistic Center at the University of Washington in Seattle. "It's quite amazing." But she notes that it's not cheap, even for retailers promising free delivery. And she notes there is growing demand from customers to have their goods delivered more quickly. "They are constantly under intense pressure to do that cost-effectively, to do that smartly and to do that well," she says. So every package that's being delivered right now, whether it's on time or not, becomes a data point for e-retailers and their delivery partners as they try to improve delivery services for next year's holiday rush. It is crunch time for getting packages delivered in time for Christmas. And companies like FedEx and UPS and the Postal Service and even Amazon are really feeling the stress. Some have struggled in recent years to keep up with rising online holiday demands. 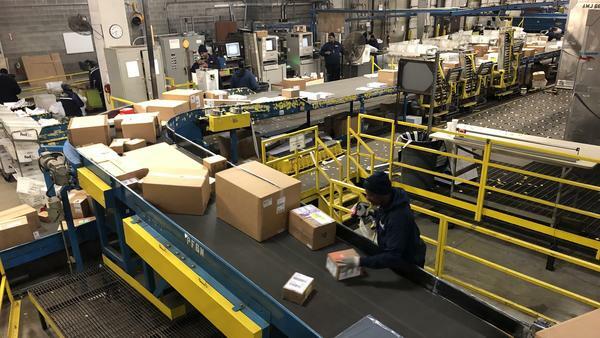 This year, they have invested billions on new facilities, on vehicles and technologies to try to get better at delivering holiday packages on time. NPR's David Schaper has an inside look. SCHAPER: ...The massive new UPS Super Hub in Atlanta. KIM KREBS: We are about the size of 19 football fields, 1.2 million square feet. SCHAPER: That's right - 19 football fields. But UPS spokeswoman Kim Krebs says it's not just size that makes this hub super. KREBS: It's the latest in operations technology powered by a lot of big data. SCHAPER: Krebs says the heavily automated facility can process 100,000 packages an hour. That's about 1,700 packages a minute zipping through the facility's 18 miles of conveyor belts. KREBS: If you look at how they're coming down and you look at the actual belts themselves, you'll see that there's different sizes and also different speeds. SCHAPER: Smart labels on the packages are scanned so they can be moved to the right place to be reloaded onto a truck. UPS estimates it will deliver 800 million packages between Thanksgiving and Christmas. And company officials say this new super hub and billions in other facility upgrades and technological improvements should help prevent a repeat of problems UPS had last year, when some 3 million packages a day were delivered late. Even with increased automation, package delivery is still very labor intensive. UPS hired 100,000 extra workers to handle the holiday crush, and FedEx hired 55,000 seasonal workers as it doubles its usual 14-million-package-a-day volume. It's still a couple of hours before dawn, and workers here at this FedEx distribution center near downtown Chicago are rolling giant metal containers off of semitrailers to be unloaded by workers who scan the packages and then place them onto one of two conveyor belts. MICHAEL MURPHY: It's a ton of it. It's constantly moving. SCHAPER: That's Michael Murphy, senior operations manager here. He says the e-commerce boom is quite noticeable, not only because customers are ordering so much more stuff online but it's also the kind of stuff they're having delivered. MURPHY: It's a rug that you might need for that front room. It's the new 70-inch TV. I just saw a bed frame go down here a couple minutes ago. So it's something that we didn't see 10 years ago. SCHAPER: Whether the boxes are big or small, there's a science to how they move down this conveyor belt. Couriers grab packages labeled for their routes and load them based on size and destination to make the most efficient use of truck space and the courier's time. When the 150 trucks are full, they launch almost all at once. But it's not chaos. It's more like a ballet than roller derby. MURPHY: It's engineered. You know, it's not a big circus. It's extremely orchestrated and very, very - almost calm, the way that they launch. SCHAPER: Engineers also design the delivery routes to keep trucks moving and not wasting time stuck in traffic. But there's no denying that all those delivery vans and trucks are choking traffic themselves and straining roadway infrastructure not really designed for this kind of commerce. The supply chain itself is not without kinks, as many packages still get lost, arrive late or left at the wrong address. And increasingly, theft is a problem. It's estimated that millions of packages are stolen off of doorsteps and front porches. And consumers are not just ordering more items every year but demanding that they get them quicker. So every package that's delivered, whether it's on time or not, becomes a data point for e-retailers and their delivery partners as they try to improve for next year's holiday delivery rush. GREENE: And tomorrow, David is going to look at the real cost of e-retailers providing free delivery. Transcript provided by NPR, Copyright NPR.